YeaPlayer is the PUP that uses misleading techniques to prevent removal. Use Reimage to locate malicious components and get rid of them faster than with uninstall instructions. A full system scan blocks virus reappearance and prevents traffic to malicious domains. 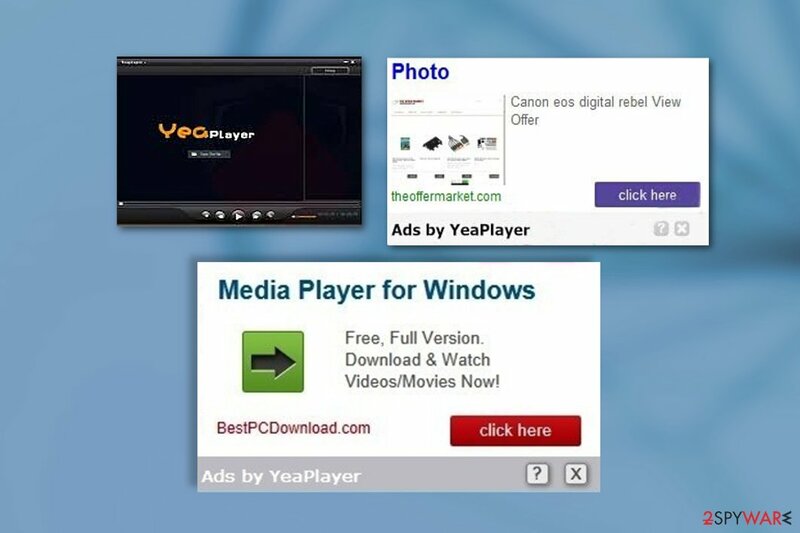 YeaPlayer virus refers to an ad-based computer infection  which sneaks into the computers pretending to be a legitimate video streaming application. Once the infiltration is done, the malware may immediately start executing its predetermined activities on the system. Its primary purpose is focused on exposing users to as much advertising content  as possible and generating ad revenue  out of it. These features allow experts to categorize Yea Player as an adware and a potentially unwanted program (PUP). Having its questionable nature in mind, you should stay away from this program and, in case you are infected, remove it from your computer ASAP. Ads, Pop-ups, and redirects that are the main traits of this software will continue to grow in quantity and frequency of appearance, so the sooner you take care of YeaPlayer removal — the better. What we recommend examining your device with some trustworthy security software such as Reimage or Malwarebytes MalwarebytesCombo Cleaner. Then, you will simply have to reset your browser to roll back the changes. You might be wondering, where did this YeaPlayer come from? Actually, like most adware, Yeah Player had a legitimate-looking official website, where users could download the application themselves. Nevertheless, yeaplayer.com seems to be down for quite some time now, meaning its direct downloads are unavailable. But did the malware stop spreading? Of course not. Adware developers have found numerous other ways to deploy the parasite on the computers, including deceptive ads, drive-by downloads  and software bundles. Quite frankly, instead of concentrating on improving the actual software, player’s creators are more concerned with creating a nice facade of legitimacy and taking advantage of all the clicks that these ads generate. We could not think of a reason why anyone should keep this software on their computers. Thus, we recommend dedicating some time to remove YeaPlayer and prevent it from bouncing back to your browser again. YeaPlayer ads can be very intrusive and cause frustration to the users whom they block from using their browsers properly. While initially,YeaPlayer seems like a reputable and useful tool, do not get deceived by the first impressions. It is actually quite similar to another player called Magnoplayer, which is also classified as a potentially unwanted program. When you install this player, some of the adware-like applications like Searchult search, istartsurf.com as well as some of the others install together with it . Sometimes these adware are installed after the player is deployed on the target system. These applications you have not even intended to install can cause some serious problems to your system and data safety. Annoying at first, later they might become really problematic since they might help promote YeaPlayer ads, send you to some bogus websites and threaten your personal data. Therefore, while this program is not malicious in itself, it might be accompanied by other programs that potentially are. For this reason, we advise selecting some other reliable media player that would not jeopardize your data security and system stability. YeaPlayer removal is easy compared to more malicious viruses which may block your antivirus from running system scans or obfuscate their files so that the antivirus tools would not detect them. Luckily, automatic virus elimination is not the only way to clean up the infected system. You may also make use of the tutorial provided below this article and remove YeaPlayer from your device manually. To make sure the annoying pop-ups, ads, banners and other files do not show up on your browser again, avoid visiting suspicious websites and refrain from downloading software of suspicious origins. Here, look for YeaPlayer or any other recently installed suspicious programs. Wait until you see Applications folder and look for YeaPlayer or any other suspicious programs on it. Now right click on every of such entries and select Move to Trash. When in the new window, check Delete personal settings and select Reset again to complete YeaPlayer removal. Once these steps are finished, YeaPlayer should be removed from your Microsoft Edge browser. Here, select YeaPlayer and other questionable plugins. Click Remove to delete these entries. Now you will see Reset Firefox to its default state message with Reset Firefox button. Click this button for several times and complete YeaPlayer removal. Reset your Google Chrome to eliminate whatever is left of the YeaPlayer. Before the reset, make sure you remove all the toolbars, extensions and other computers that you suspect may be related to the adware. Here, select YeaPlayer and other malicious plugins and select trash icon to delete these entries. Click Reset to confirm this action and complete YeaPlayer removal. Here, select Extensions and look for YeaPlayer or other suspicious entries. Click on the Uninstall button to get rid each of them. Now you will see a detailed dialog window filled with reset options. All of those options are usually checked, but you can specify which of them you want to reset. Click the Reset button to complete YeaPlayer removal process. ^ What is Adware?. KasperskyLabs. Antivirus software blog. ^ What is content advertising, and should you be doing It?. Wordstream. Online advertising made easy. ^ John Zorabedian. How malware works: Anatomy of a drive-by download web attack (Infographic). Sophos. Security news blog. This entry was posted on 2017-05-03 at 02:19 and is filed under Adware, Viruses. You can quickly scan the QR code with your mobile device and have Ads by YeaPlayer manual removal instructions right in your pocket. How did you remove YeaPlayer ads?